Subject: Filling up of various posts in the Food Safety and Standard Authority of India HQ, New Delhi and Regional Offices at New Delhi, Mumbai, Chennai, Kolkata and Guwahati through transfer on deputation on foreign service terms/Short Term Contract/Contract basis - reg. About the FSSAI Organization: The Food Safety and Standards Authority of India (FSSAI) is an autonomous statutory Authority set up under the Food Safety and Standards Act, 2006 for laying down science based standards for articles of food and to regulate their manufacture, storage, distribution, sale and import, to ensure availability of safe and wholesome food for human consumption. 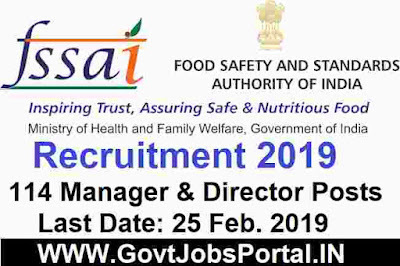 About this FSSAI Recruitment 2019: FSSAI proposes to fill-up positions from officers of the Central Government or State Governments or Union Territories or Universities or Recognized Research Institutions or Public Sector Undertakings or Semi–Government, Statutory or Autonomous Organisations on transfer on deputation on Foreign Service terms/ short term contract basis failing which from retired Govt. officers on contract basis as per the details contained in Annexure–I. Applicants fulfilling the eligibility criteria & experience, etc may apply online on the link available on the FSSAI website i.e. www.fssai.gov.in. The last date of online application is 25.02.2019. Educational Conditions: Please check the Official Advertisement file given under IMPORTANT LINK section for detail information about the qualification related to the various job profiles. 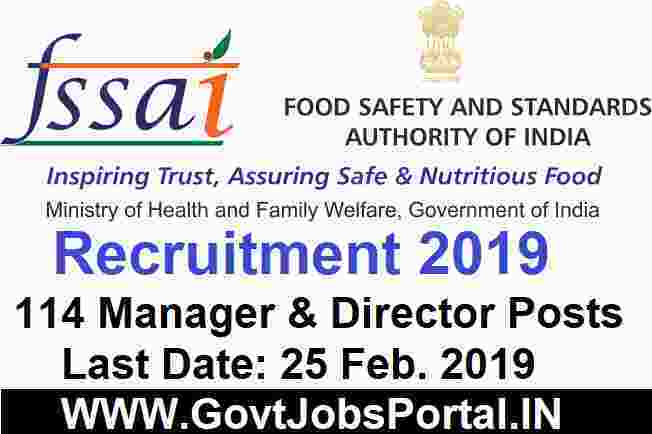 Procedure for applying these Government jobs in India is online through the official website of the FSSAI department. Government job Applications can be submitted through the department website whose link is : “https://fssai.gov.in”. The process for Filling up of online application will remain activated up to the closing date of 25th Feb. 2019. So all eligible candidates needs to apply online before the last date.